This is the master page for the Bento Decoration Techiques section. Fundamentally I’m not very pro-decoration. 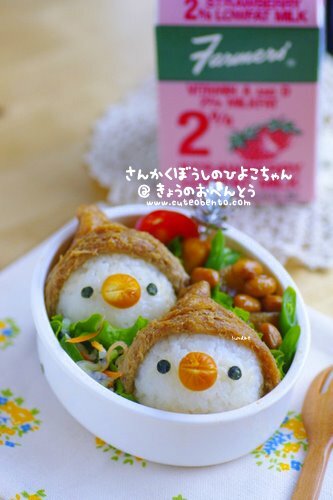 My aim, and the aim of Just Bento, is not to present cute and highly decorative bentos - there are other sites that do that much better than I’d ever have the inclination to. 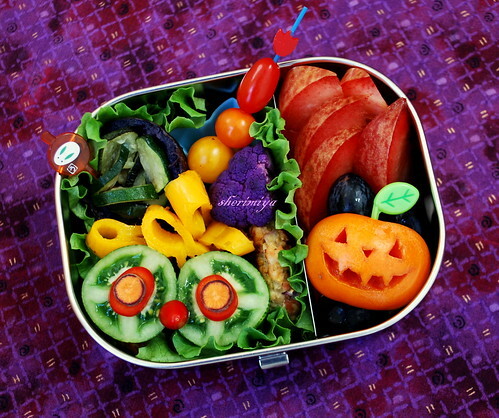 I prefer to make my bentos look nice by putting in colorful vegetables and things like that. However it is true that adding a one or two decorative elements can make an otherwise rather ordinary bento come to life. So, as time allows, I’ll periodically present a decorative technique that you might find useful for jazzing up your bento boxes. Do keep in mind that the decorations are just that: extras, and they do add time to your bento making time. I would generally reserve these for special occasions. Previously, I showed you how to make orange colored carrot rice . The make-in-a-few minutes microwave method was especially popular. So, here’s how to make pink (or purple) and green colored rice just as easily. The best thing about them is that they are colored just with vegetables - no hard to pronounce ingredients in sight. I’ve used white rice for color clarity, but you could use regular or sprouted brown rice instead. I used leftover rice from the night before; you could also use defrosted frozen rice . Grate the red cabbage as finely as possible - a microplane grater  is the best tool for this. The more red cabbage you use, the more purple the rice will be. Add a few drops of lemon juice to the grated cabbage a little at a time. It will turn redder and redder. Mix the cabbage with salt and oil, and spread on top of the rice. Cover with plastic film and microwave on HIGH for 1 minute. Mix together very well. It doesn’t taste cabbage-y at all, and the lemon juice adds a pleasant slight sour note, rather like sushi rice. Put the peas in a small bowl and microwave on HIGH for 30-40 seconds to defrost them. Mash them up as finely as you can with a fork, or in a mortar and pestle. Mix the peas, salt and oil with the rice and microwave on HIGH for one minute. Mix together very well. For a more flavorful orange colored carrot rice, see this page . This is a simple version which omits the onion. Grate the carrot as finely as possible. Place on top of the rice with the oil and salt. Cover with plastic film and microwave on HIGH for 2 minutes. Mix together very well. You could use one kind of rice at a time, or two or more at once. Remember that plain white rice would give you one more colorway. 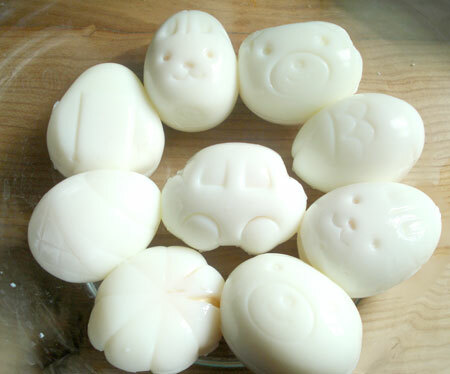 I think I will use the onigiri molds the most - it’s really quick to form little onigiri with them, so they could be used for everyday bento. The nori punches and the shape cutter are more fiddly to use so I’ll keep them for special occasion bento when I have time to pull out the tweezers and such. (It took me almost as long to put the nori faces on just three of the onigiri than it did to make the colored rice and form six onigiri.) But don’t you think a plate of multicolored onigiri would be great for a party? So you see, I’m not against all charaben/kyaraben . As long as it’s all-natural and easy to make, I’m all for it! Apples are such great fruit - available almost any time of the year, inexpensive, and handy. 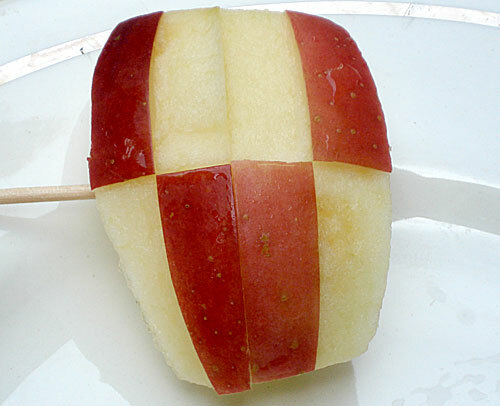 While simple apple slices or even a whole apple are welcome additions to a bento box, if you just spend a few minutes cutting the pieces in decorative ways, they can really perk up your bentoscape, as Tracy showed us in the last post . 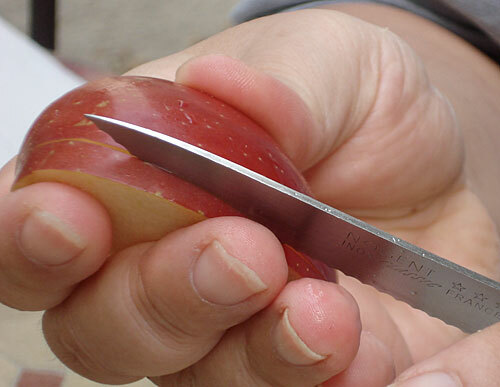 We sort of grow up in Japan knowing how to do some fairly simple apple cutting techniques. (Or at least, I remember my mother and aunties doing this sort of thing when I was little.) Here are some that you could use, from the basic to the more complicated. 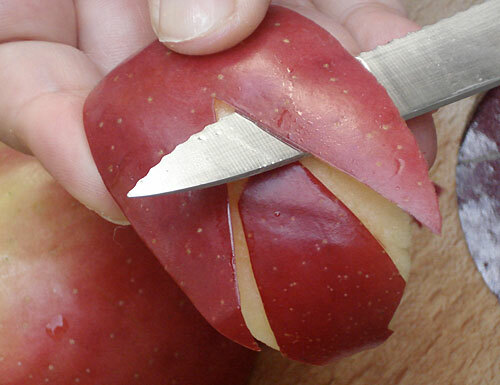 All you need to cut your apples are shown here. 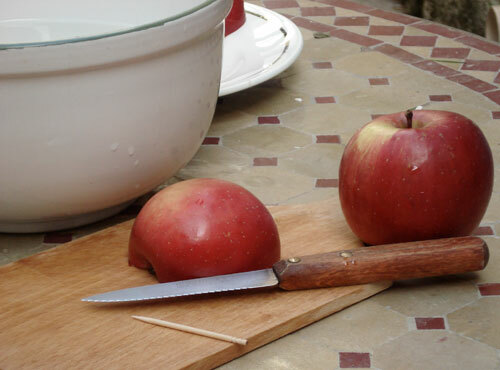 A cutting board, a sharp small knife (here I have a serrated one, but a smooth bladed one is better really), a toothpick, and a bowl filled with acidulated water (cold water with some lemon juice in it) to dunk the apple slices in to stop them from turning brown. 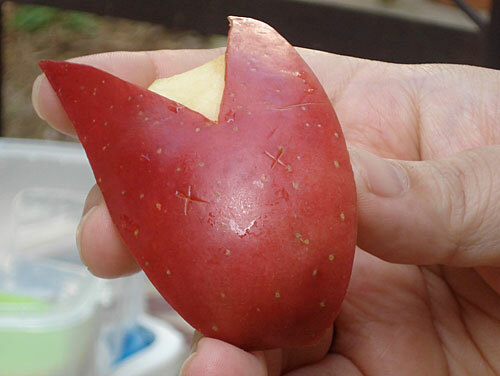 Apple bunnies, or usagi ringo (うさぎりんご）are the most commonly seen decorative apple cut. 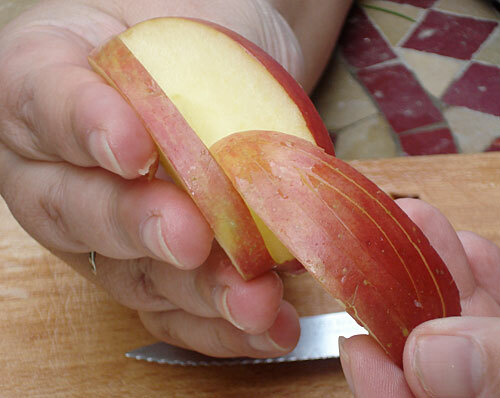 It’s also one of the most simple, so while I’ve already written a tutorial on how to make them  (way back in 2004), and there are several other tutorials out there, but I thought I’d go over it again to establish some basics of decorative apple cutting. 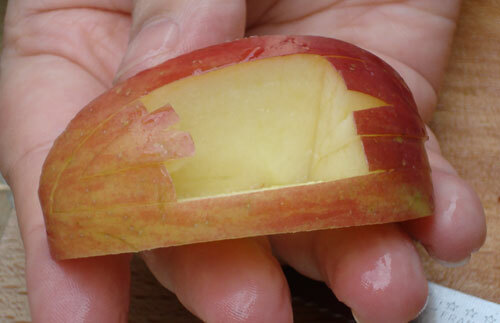 First, cut out a wedge from the apple, and cut out the core. 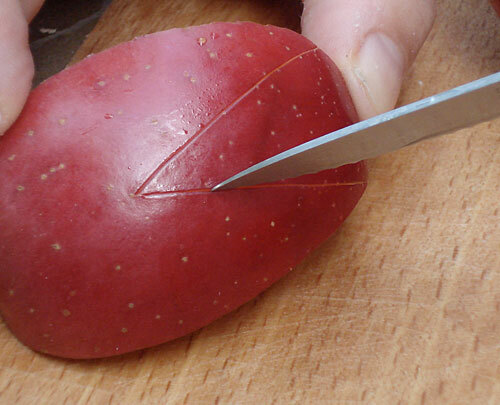 Score the skin with a V shape with your knife, as shown. 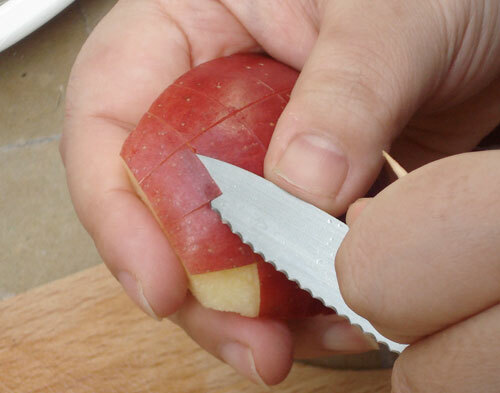 Carefully lift out the center V point (the part you’re going to cut away) with your knife. This helps to make a clean point there. Cut under the outer points (the ears) fairly close to the skin. Cut them all the way down to the center V point. Peel away the center skin, taking care not to cut into the ears. Voilà, your apple bunny! You can cut eyes in, stick in cloves there, or just leave the ‘face’ bare, for a modern minimalist bunny. 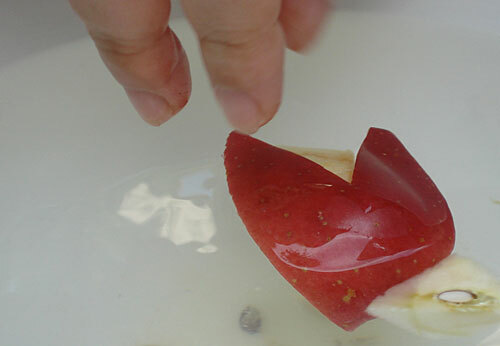 After you’ve finished cutting, dunk the apple wedge into the bowl of acidulated water. You might want to dip the wedge while you’re working on it, if you see it turning brownish. This will also make the bunny ears stick up and curl up a bit. Cut out a wedge and cut away the core. Score the surface with a sharp knife. Cut away the parts you don’t want, working from the corners first. Dunk in acidulated water to stop it from turning brown. A two-color checker pattern is called ichimatsu moyou (市松模様）in Japanese. It’s a decorative cut that’s appropriate for any bento. You can make the pattern as small or as big as you want. This cut is not hard, but is a bit fiddly. 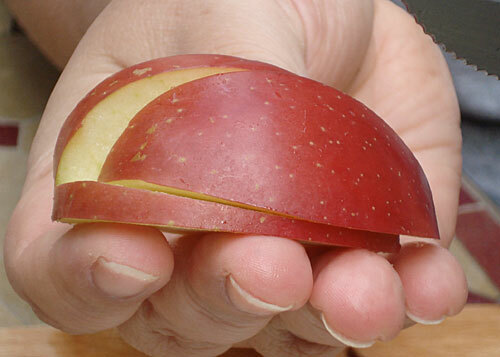 Start with a fairly wide apple wedge. 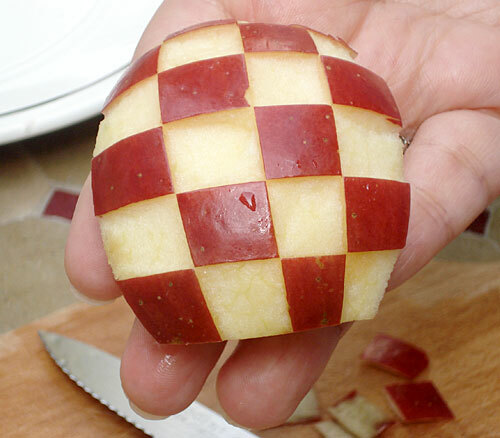 Score the surface with your knife in a checkerboard pattern. Make the checkerboard as evenly spaced as you can. 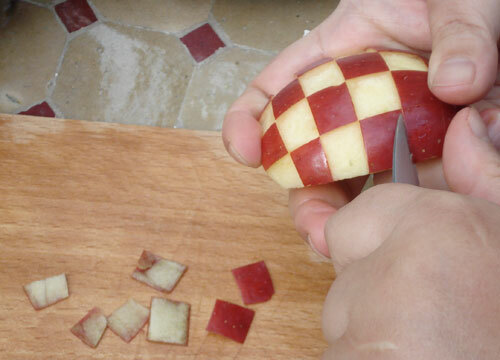 Then all you do is to cut out and peel/pry off alternate squares of skin, using your knife or (if the checkerboard is very fine) the tip of a toothpick. Keep going, taking care not to cut into the ‘on’ square skins. You can tidy up any rough edges later. Here’s a finished wedge. Looks rather modern doesn’t it? Here are two thin wedges with one big checkerboard cut into each (so you have a cross pattern). The wedges are skewered together with a toothpick. 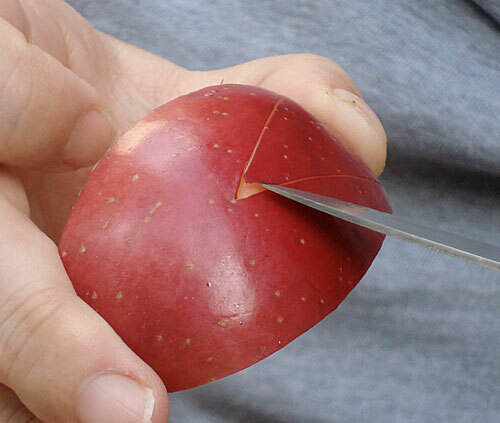 This is even easier to do than an apple bunny. You could use this basic score-and-cut-away technique to make all kinds of decorative surface patterns. 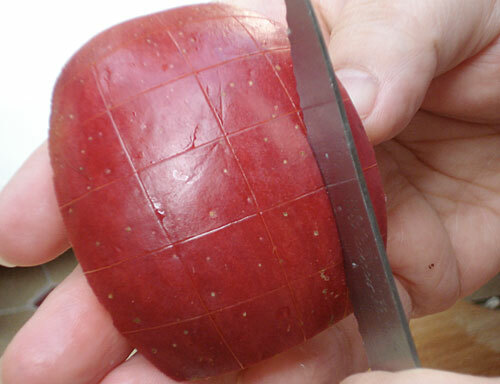 This is a more advanced cut, that may take some practice, but the results are rather spectacular. If you have the time and patience these are very nice as party-buffet type decorations. 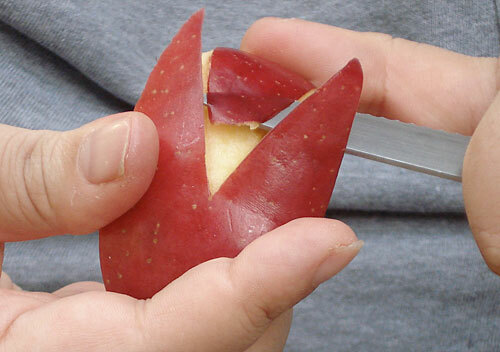 First, cut out a wedge of apple. Carefully score the wedge about 3mm / about 1/10th of an inch from the edge. Cut along the score, parallel to the sides of the apple, down into the wedge in a V. Your aim is to cut out a smaller wedge, like so. Carefully slice back the wedges, staggering them. You’ll end up with this, which looks a bit like a 3-D leaf with prominent veins. Dunk in acidulated water. 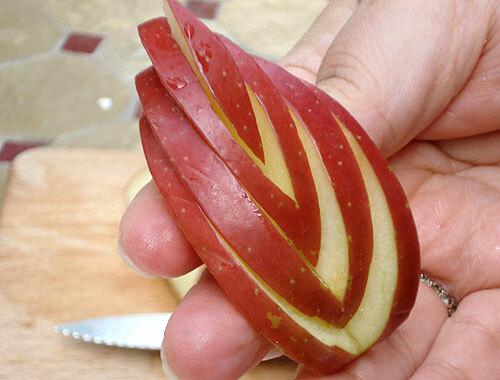 This is a variation on the apple leaf. 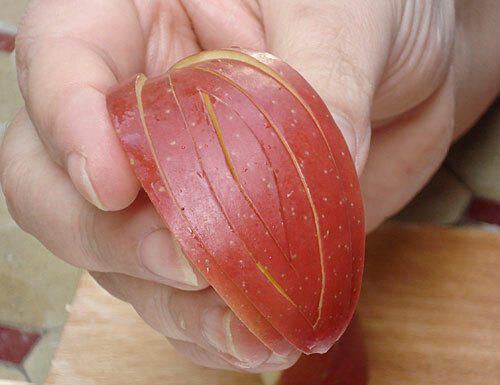 Cut out the inner wedges as for the apple leaf, and slice them out of the outer wedge. Cut both ends of the inner wedges. Re-assemble the inner wedge ends inside the outer wedge as shown, to form a sort of boat shape. You could put some things inside the boat - how about a little row of blueberries for example? Japanese people love wiener sausages . They appear quite often in home cooking recipes . Wieners are the Play Doh of the bento making world since they are colorful and easy to manipulate. 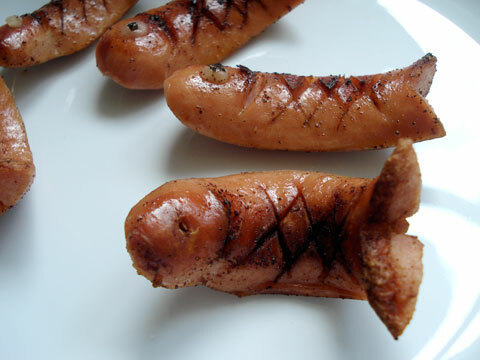 I don’t like to use wieners their relatives very often, though living in a Germanic area of Europe we can get pretty good ones that aren’t dyed a bright pink and actually contain real meat. But once in a while they do appear in my bentos. You can use a finely ground sausage of any type: wieners, frankfurters, Lyoner, Cervelas, etc. Chicken, turkey, fish even or vegetarian franks should theoretically work, as long as they are flexible enough Try bending one; if it snaps it’s not going to work for this., though you could still use it for cut shapes. The sausage has to be cohesive with a rubbery texture. Coarse ground sausages won’t work. So here’s an exhaustive step-by-step for your enjoyment. The basic tools: A small sharp knife; cocktail sticks; and a wiener. To make two flowers, you need 1 whole wiener and a bit of another. Cut one wiener in half, lengthwise, down the middle. Here it is, flayed open and vulnerable. If you have chosen a fairly naturally made wiener, it should have a slight curvature, like this one. Place one half cut site down on the cutting board so that it curves away from you. Make small cuts along the wiener, as illustrated. Be careful not to cut all the way to the other edge. Here are the two halves with the cuts finished. Cut two small vertical slices from another wiener, like so. Make small, shallow cuts on the surface of each small wiener round in criss-cross fashion. When you are done it should look like this. In the meantime, bring a small amount of water to boil in a pan. Now you need to fit the ‘petals’ part around the ‘flower center’ part. As you can see, the ‘petals’ are a tad long, so you need to trim it a bit to fit. Pin the ‘flower’ together with cocktail sticks. I find I need two: one to pin the ‘petal’ part closed, and another to skewer the ‘petals’ to the center. Be gentle here and try not to break the petals! Boil them for a few minutes to set the shape. When the cuts in the center part have opened up a bit they can be taken out. You can use the boiled ones as-is, but I like to put a little color on them by panfrying them briefly. Well, it took me about 15 minutes to make 4 flowers, using 3 wieners. Your results may vary. Practice, practice. 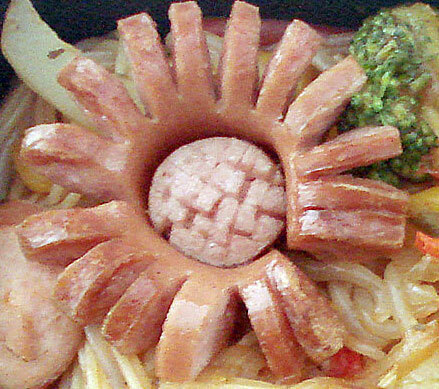 I chop up the extra bits of leftover wiener and put it in the bento the flowers will adorn, as I did in Bento no. 13 . 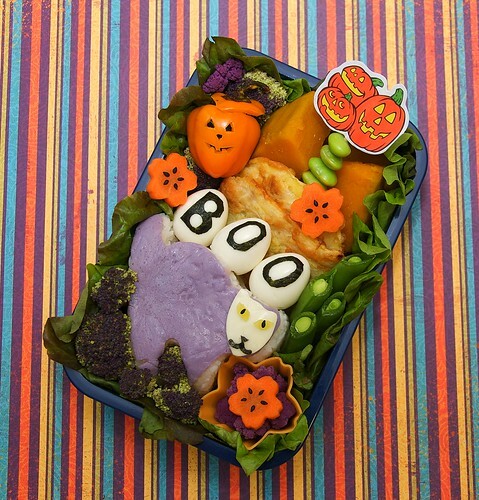 This is a very simple yet quite pretty bento decoration that I saw in a Japanese magazine. 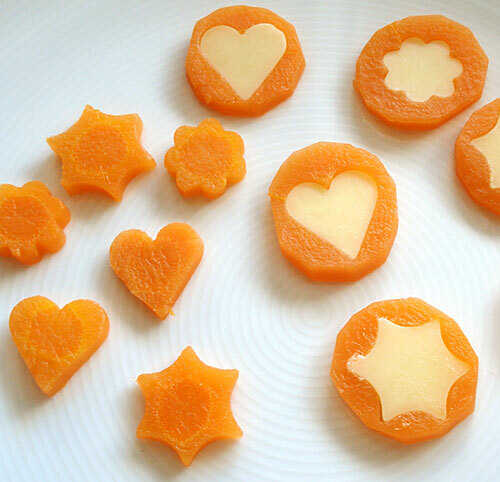 Just take slices of cooked carrot (I just boiled them for a few minutes in salted water, but you could use the orange carrots recipe  too), stack on top of a slice of cheese, and cut through with a small cutter. 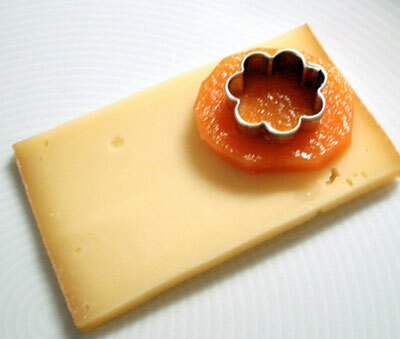 Then pop out both cut-out pieces, and insert the cheese cut-out into the carrot circle. The result is a nice bi-colored decorative piece. You can of course use the cut-out carrot part too. Incidentally, I found the tiny cutters used for this in the craft section. They are sold as polymer clay cutters, and are about 1 cm / less than 1/2 inch in diameter. I don’t use them for polymer clay of course - they’re reserved for food. 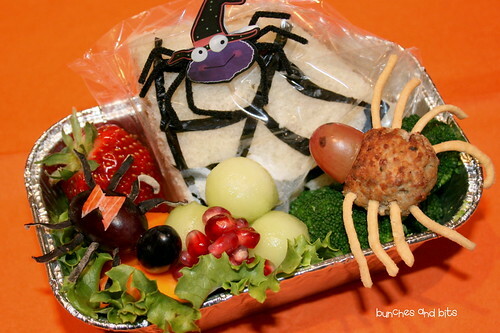 Due to being in hospital/sick and all that kind of not-fun stuff, I didn’t get to do a Halloween bento roundup  this year. 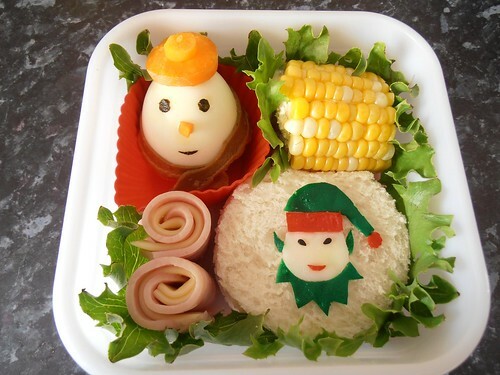 So to make up for that, here’s a Christmas bento roundup from the always inspiring JustBento flickr pool . I’ve especially picked out ones with simple yet clever, easy to copy ideas - so that you could make yourself a cherry Christmas bento too! 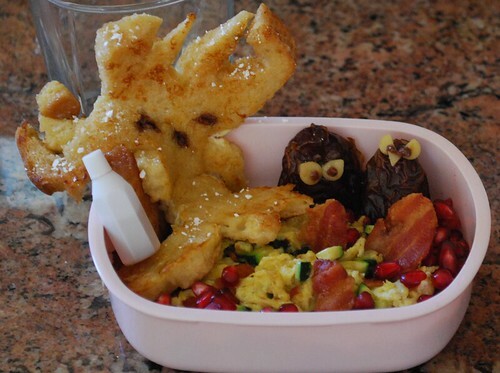 First up is another great bento from the ever talented Sheri of Happy Little Bento , whose work I think has appeared in every single bento roundup I’ve ever done. 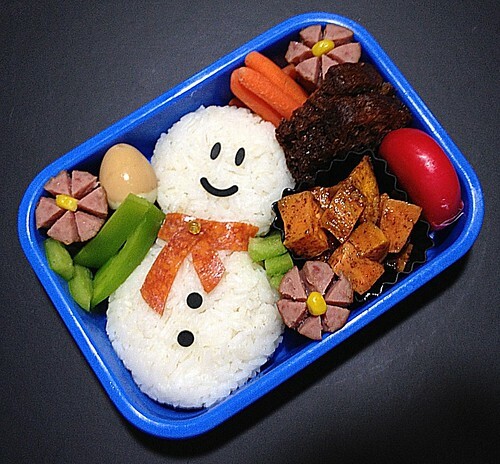 I chose this out of the many Christmas bentos she’s done this year because of its simplicity: the snowman is made out of two quail eggs stuck together, essentially. The dried cranberry buttons are so right! Read more about this bento on her blog . Here is another egg-Snowman by Ariani of Bebento . This one features a little carrot hat. There is also a cute little cutout elf, which probably takes more skill and patience. Check out more cute cutouts on her blog . Maki-san aka luckysundae of Cute Obento  and co-author of the fabulous Yum-Yum Bento Box book , is a pro at using simple ideas to make the cutest bento decorations. Here she creates two little Santa chicks from inarizushi , cleverly using the skins as hats. The beaks are the cut off ends of wiener sausages. 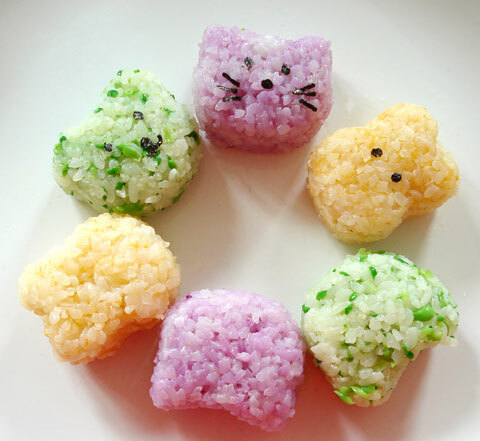 Onigiri (rice balls) are always the easiest things to shape into something cute. This snowman by Genetta of the appropriately named My Lunch Is Cuter Than Yours  couldn’t be more straightforward, but is so effective. Notice how even the red of the Mini Babybel adds a festive holiday air? The jaunty peperoni scarf is a very nice touch. Read more about it here . 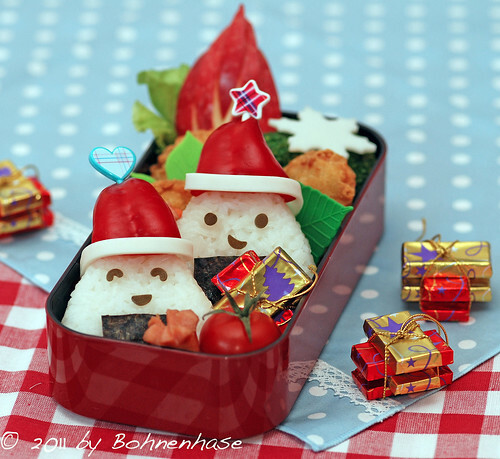 And last but not least is this cutest of cute Santa Claus onigiri bento by Mokiko of Bohnenhase . The bright red Santa caps are the ends of red peppers (a really versatile part of the vegetable ) and the white bands are strips of cheese. And I just love the staging, with the tiny bundles of chocolate ‘presents’! More about this bento in English and German here . Happy Holidays to all bento fans! By the way, I haven’t spotted any Chanukah or Kwanzaa bentos this year (although this lovely Chanukah bento by gamene of Bentozen from 2 years ago  is still a standout). If you’ve seen any, let me know. I’d love to see what creative things people come up with…as long as it doesn’t go the wacky Sandra Lee route  of course ^_^;. As I’ve stated here on these pages several times, while I greatly admire the artistry and skill of kyaraben/charaben artists, I rarely have the time to do such cute things. Not that I don’t like to get artsy and crafty - I do. But there are much easier ways of doing that. 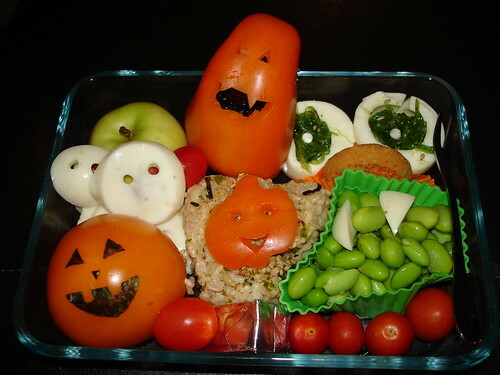 Why bother with cute touches to your bentos? Why, to put a smile on someone’s face of course, including your own. 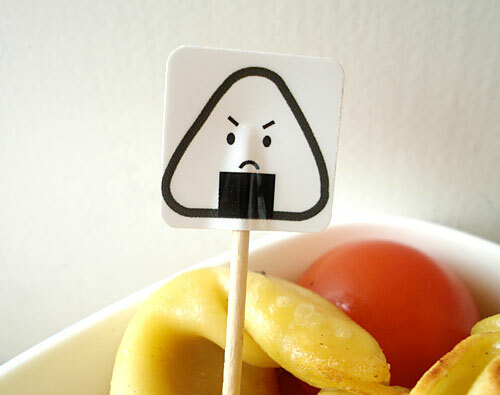 I’ve talked about using simple geometric shape stickers  to make ‘faces’ on your bento or lunchbox items before. This takes sticker usage a bit further. I’m a bit obsessed with cute onigiri faces at the moment (if it weren’t obvious from my last couple of posts). I’ve been making a variety of them for all kinds of moods. 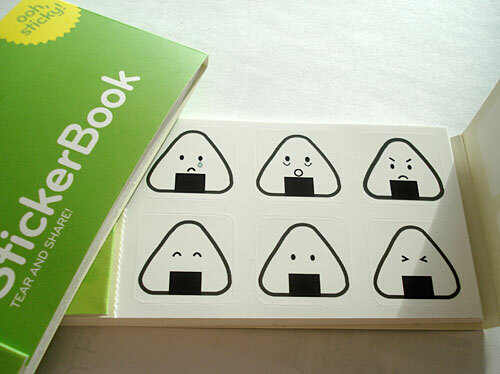 I took six of the onigiri face designs (see some of more at the top of this article ) and ordered a couple of sticker books from Moo.com . I could have included more designs - they allow up to 90, so you could have 90 different stickers. Here I use a couple of stickers back to back on the end of a toothpick to make a customized pick. Hint: the stickers stay on a lot better if you can flatten the round toothpick a bit, with a hammer or something. So if you’re like me, and want to add some fun and smiles to a bento recipient but don’t have the time or patience for charaben, consider making your own stickers! Of course, the stickers can be used for non-bento applications too. Something fun from the archives, in keeping with Easter. Incidentally, I haven’t been able to make any bentos, let alone update Just Bento this week, due to a sudden change of plans, but I’ll be back next week with frugal bento recipes and more. So until then…enjoy your weekend! 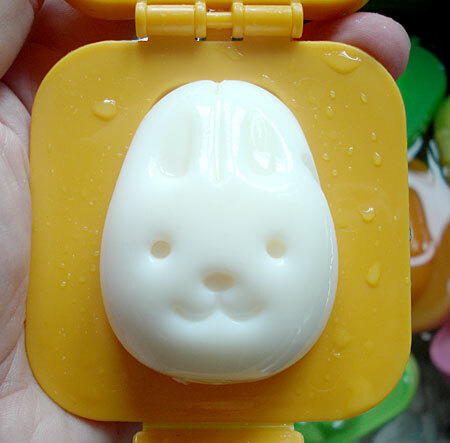 Egg molds are offered by various online sources such as J-List and eBay merchants (see the left sidebar for some listings), as well as at 100 yen stores. 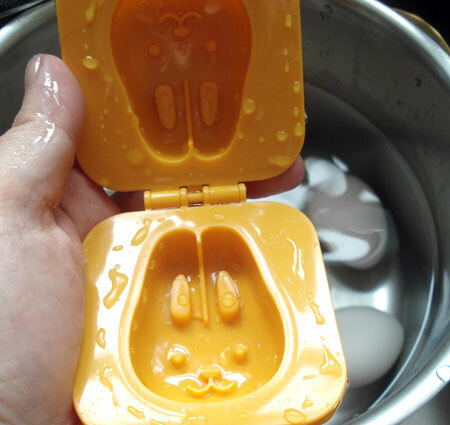 There are two types of egg molds: one has a simple clamshell shape with a fastener, and the other has a inner half-shell. You can use the latter kind without the inner half-shell too. Either way, be sure you get one that has the clamshell shape and the closing fastener - these features are what make an egg mold work properly. The three types of egg molds I have all say to use an “L” size egg. In practice, I’ve found that either an “S” or “M” size works the best for most molds, though some require an “L”. In EU terms you want to get eggs that are either in the 50g or 53g + categories. You may want to experiment with the eggs you can get locally to see what size fits best. Extra-Large and Jumbo eggs, in U.S. terms, are definitely too big though. Boil the eggs by putting them in cold water and bringing slowly up to a boil. Once the water is boiling, take off the heat, put on a lid and leave for 8 to 10 minutes. To peel the eggs cleanly, dunk them in cold water, crack the shell over, and peel carefully. Very fresh eggs are hard to peel cleanly, but you rarely get very fresh eggs at regular supermarkets. 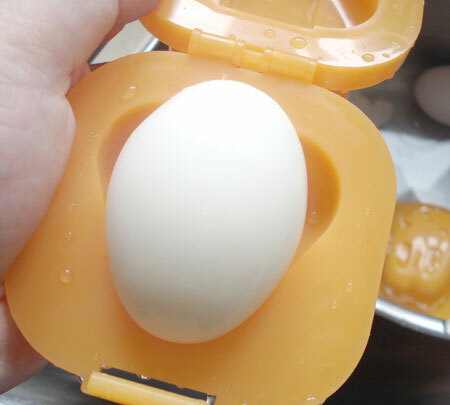 The egg mold instrutions call for a hot egg, which is more elastic than a cold egg, but by the time you’ve peeled the egg or several eggs, your egg is probably cold. 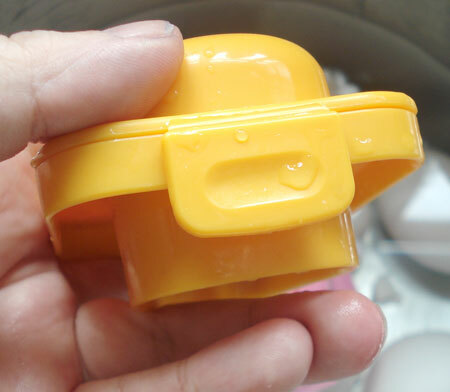 To get around this problem, I dunk the peeled eggs in a pot of hot water to warm up, before proceeding with the molding. 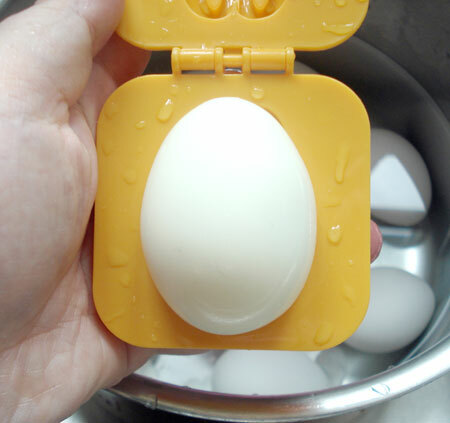 This method also works well if you start out with storebought hardboiled ‘picnic eggs’. Make ready a bowl of cold water. 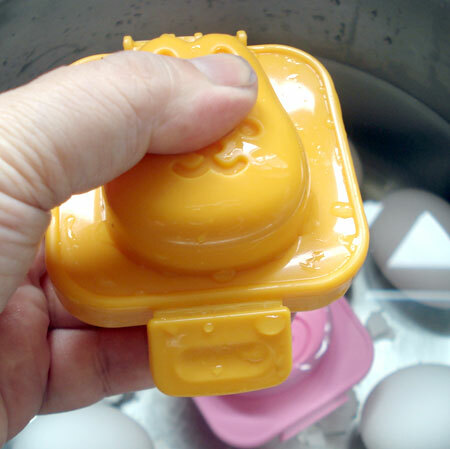 Open up the mold and wet the surface just in case your egg decides to stick (though it shouldn’t). Put in a hot egg. 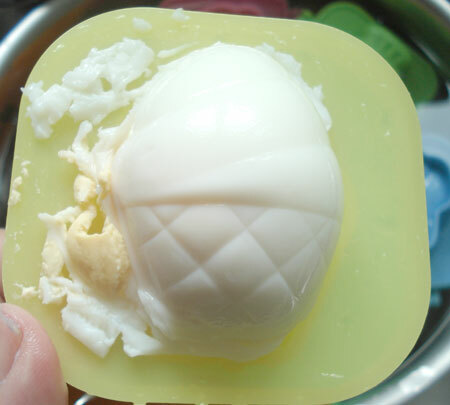 The shape of the mold will guide you as to how to place the egg. Here the bunny face is wider in the bottom, so the fat end of the egg goes that way. Close the mold firmly - don’t hesitate or get nervous if some egg white squishes out at the sides. Close the fastener until it clicks. 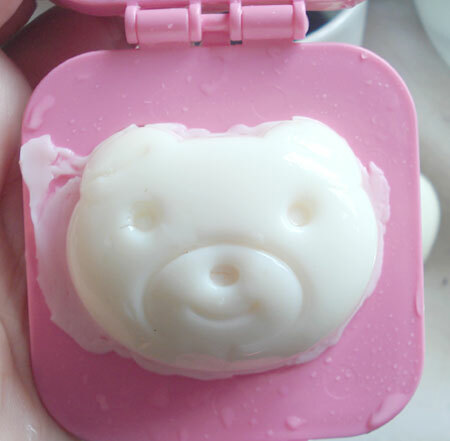 Put the whole mold in the bowl of cold water, and leave there for at least 10 minutes. 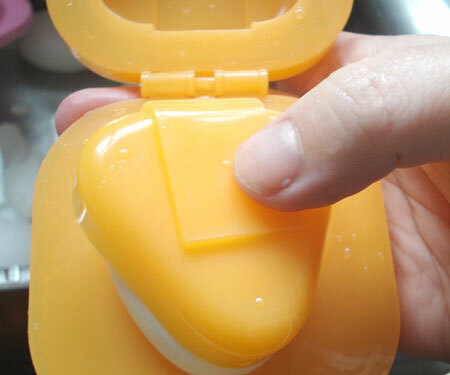 If you have the type of mold with an inner half-shell, first put in the egg as with the simple clamshell type mold. Put the half-shell over the egg and press firmly. Close the clamshell over it and squeeze. Fasten with a click. This is an egg that came out perfectly. This is the ideal. This one has some egg white bits that got squished out at the sides. You can clean the ragged bits up with a sharp knife. This one is a failure. It failed because the yolk was to the side of the egg. I would just chop this up as egg salad. So, once you have peeled your eggs, instead of dunking them in plain hot water, put them in colored hot water until they have achieved the color you want. Then mold them as per above. The seam will show white, but the form and overall color are there. 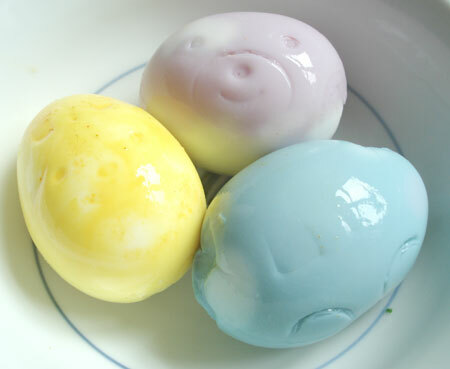 Personally I prefer the plain white molded eggs - if I am dyeing eggs, I’d keep them egg-shaped. It’s up to you though! What else can you do with egg molds? 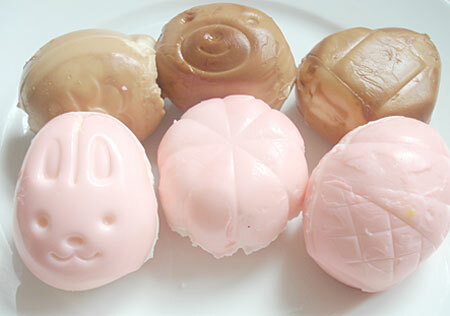 You can use them to make small onigiri, as I did for the bunny and cat shaped onigiri here . 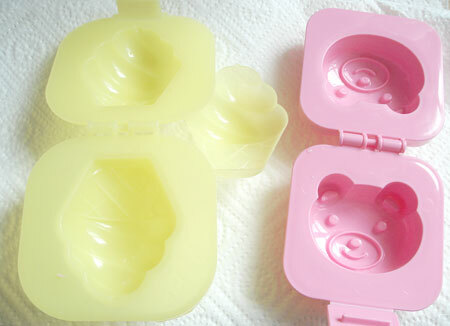 You could also use them to make chocolate molds, or form any kind of plastic or moldable material. Let your imagination run wild. 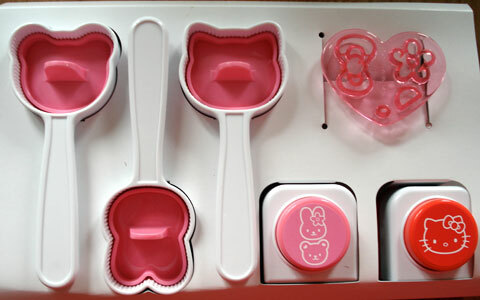 All About has a couple of articles about using common household items to cut out pieces for bento. How to use bottle caps, medicine cups (the kind that come with cough syrup or Nyquil) and straws to cut out parts from cheese  and make simple onigiri from the parts ; also a bear shaped onigiri how-to . Youchien-net , a site for parents of kindergarten age children, has several kyaraben tutorials for beginner to intermediate levels  with step-by-step photos. The most recent one is for the bunny face bento  in the picture above, by the winner of the recent Sanrio bento contest , Mihochin-san. This one looks doable even for beginners. The pink stuff on top of the rice used for the face is pink soboro (or sakura soboro), flaked semi-dried cod that has been dyed with food coloring. You can buy this at a Japanese grocery store, but if you want to avoid food coloring you could use salmon furikake  instead. 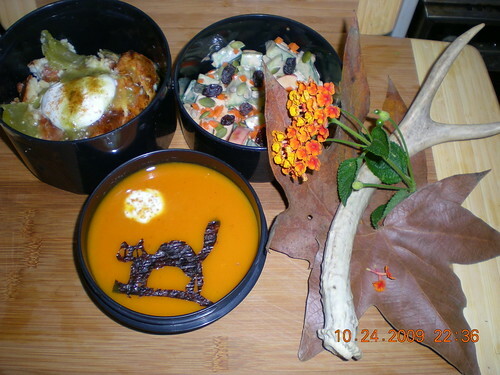 On her blog, Mihochin-san shows a bear bento variation  that uses meat soboro on rice  for the face, and meatballs for the ears (you could use tofu tuna burgers  instead). The eyes are circles cut out from large black beans (otafuku-mame) - you could cut out kidney beans, or just use whole beans. Mihochin-san (who also seems to be a serial bento contest entrant - winning a lot of them too) has another tutorial, for making an amazing Naruto bento . She uses pale pink ham for the face, thin omelette or usuyaki tamago  and sliced processed cheese for the two-tone blond hair and eyebrows, some cooked kombu seaweed, fish sausage and nori for the hair band, kamaboko (dyed blue with something called “Blue Hawaii” for the pupils) for the eyes, darker pink ham and more white kamaboko for the mouth, and nori for the line details. She says that while it takes her about 30 minutes to make such a bento, for a beginner “it might take a lot of time”. No kidding! If you love character bentos (kyaraben), you may wonder how the creators manage to color some of the elements. Do they use food dyes? Not necessarily. Bentobako.net , called Ranchi-ryuu Obentoubako Community (Lunch-style Bento Community) is an attractive and very useful bento resource site in Japanese. One of the most interesting sections that they have recently set up is the Bento Coloring Dictionary , a reader-contributed section with lots of ideas for making various bento elements colorful without resorting solely to food dyes. Here are some of the ideas listed there, arranged by color, with my notes in parentheses. I’ve added the formulas for deriving 3 (or 4) different colors from one ingredient - red cabbage juice! Light pink/flesh colored rice: Grind up some sakuraebi (small dried shrimp), and mix into rice. Good for making faces with rice. Bright pink sushi rice: You can buy something called denbu or sakura denbu at Japanese grocery stores. This is dried flaked cod that has been colored with food coloring. This can be mixed into rice (sushi rice is best) to make bright pink rice. 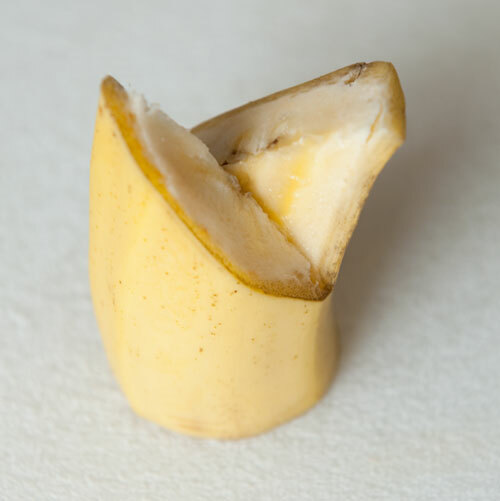 Not totally natural, but colored denbu is used in sushi rolls…. Purple ham: Marinate pink ham in red cabbage liquid (see pink eggs above, but don’t add lemon juice) to make blue-purple ham! (Method used for the Genie in the photo at top.) 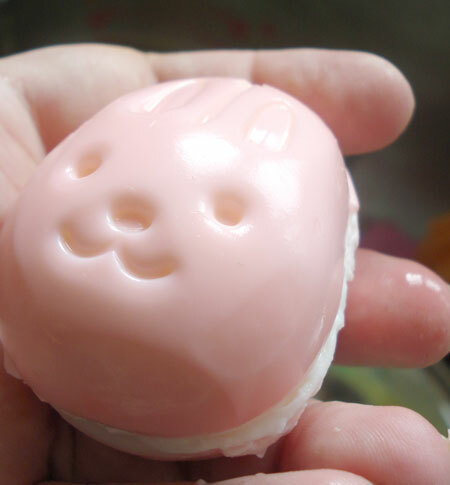 You can also use red cabbage liquid to color kamaboko, sausage, and so on. Purple potato powder again: It seems purple potato powder can turn things blue or purple, or perhaps something in between. Bright orange-yellow rice: Mix in some mashed kabocha squash - using frozen kabocha is the most convenient. Green rice with broccoli: Chop up some broccoli stalks finely, stir around in a dry frying pan to take out excess moisture, flavor with salt and pepper or even with mayonnaise (! ), and mix into rice. Use inarizushi skins - right site out and inside-out: Use storebought inarizushi  skins as-is for dark brown, and flip them inside out for light brown. Meaty brown rice: Mix meat soboro  with rice. Saucy brown rice: Mix soy sauce with butter, just soy sauce, or tonkatsu sauce (or Worcestershire sauce) into rice to turn it a light to medium brown. The best black is nori seaweed! Grind up some shirasuboshi (tiny little semi-dried fish) and mix into rice for a grey rice, suitable for making Totoro for instance. The first time I saw red cabbage juice being used as a magical natural food coloring was on the popular Japanese TV show called Ito-ke no shokutaku  (The Ito Family’s Dinner Table - no relation!). They used it to produce pink and blue takoyaki! Red cabbage juice popped up a few times in the coloring methods, so here are the formulas for producing various colors. Add to already boiling water. Allow for about 2 cups of cabbage to 4 cups of water. Boil for just a minute or two. This extracts the color from the leaves, but not the cabbage-y flavor. For purple, use the liquid straight. For red (which is actually more like a bright pink), add a few drops of lemon juice or another acid like vinegar. You’ll see it magically turn red before your eyes! For blue, add a little baking soda. It’s best to make a baking soda slurry of sorts and add that liquified form to the water bit by bit. Beware though - if you add too much baking soda the liquid, and whatever you marinate in it, will taste like baking soda, which is not very pleasant. For brown (though I don’t know why you’d need this since so many other things are naturally brown), add egg yolk. Be sure to visit the original Bento Coloring Dictionary  for photos representing the coloring methods - clicking the colored tabs at top lead you to each color section. I hope these coloring methods have given you some ideas and gotten your creative juices (no pun intended) flowing. 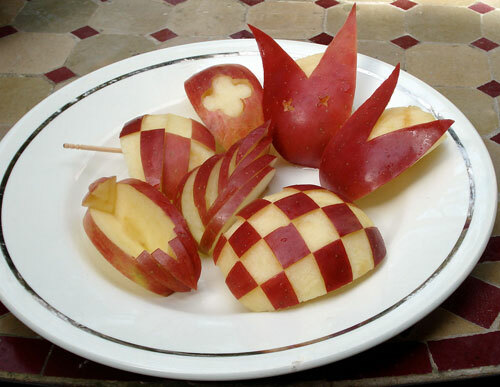 If you have other ways of naturally coloring your food for fun, please let us know in the comments! A couple of people asked about the twist-cut banana slices that were tucked into a corner of the scotch egg bento . This is actually a very simple decorative cutting technique that can be done in a couple of minutes, even if you are a beginner. I learned how to do this cut back in my first year of middle school (7th grade in U.S. school terms, or when I was 12-13) in home economics class. It’s usually called chigai giri (違い切り) or ‘opposing cut’ in Japanese. I also call it the ‘twist cut’, since the business end of the cut looks like it is twisted. There’s more than one way to do this cut, but here’s the way I learned how to do it. It still works best for me. 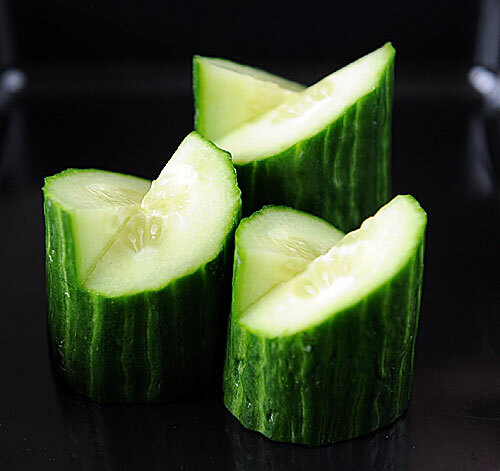 I’m showing this with a banana, but you can do this with cucumbers as you see in the photo up top or any cylindrical food that would stand up firmly on its end. Sausages? Cheese sticks? Carrots? It’s up to you! 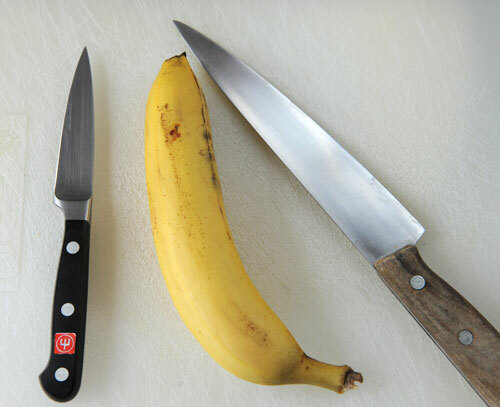 To make ready: Two knives, the fruit or veg you are cutting, and a cutting board. The size of the knives doesn’t matter. 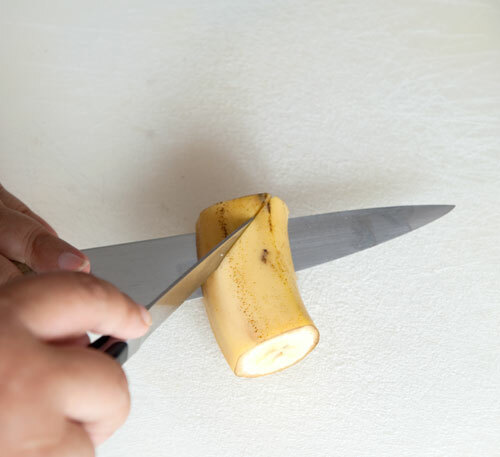 If you’re doing this with a banana, something else you will need (not in the photo) is a cut piece of lemon. Cut out a piece of banana (or cucumber, etc.) from the middle that is fairly straight. You can usually get 2 to 3 sections out of one banana. 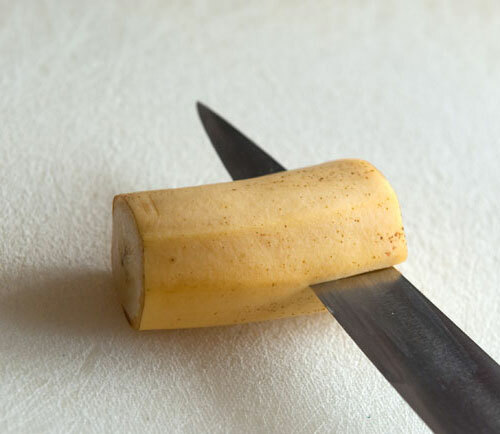 Cut horizontally in the middle of the banana (or cucumber, etc.) to 1/3rd to 1/2 way through the length of the piece. Leave that knife in. 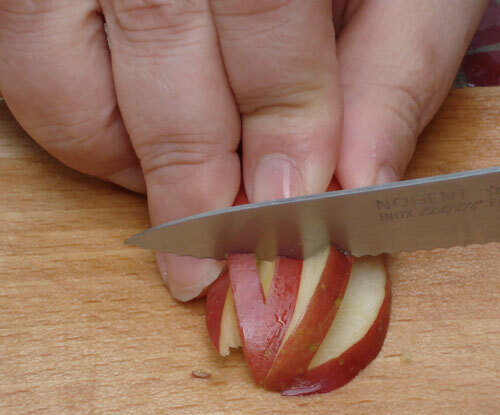 With the other knife, make a diagonal cut from the top of the piece. 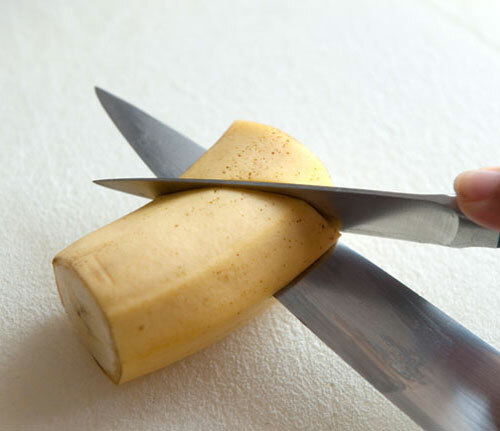 I’ve taken my hand away so you can see clearly where I’m cutting, but you’ll want to keep a firm grip on the banana piece to steady yourself if you’re a beginner. Now turn the piece over. With the first knife still inserted in the middle (if it came out, put it back in) make another diagonal cut that faces the opposite direction from the first cut you made on the other side. 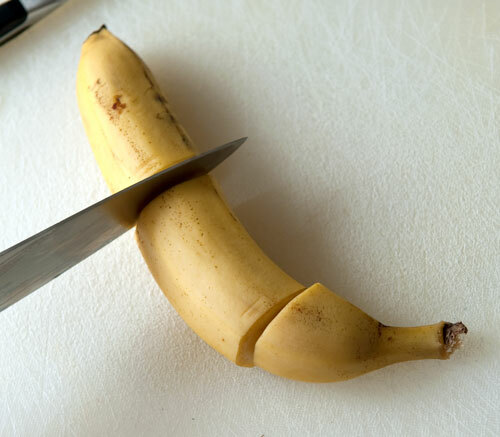 Rub the cut ends of the banana with the cut lemon. 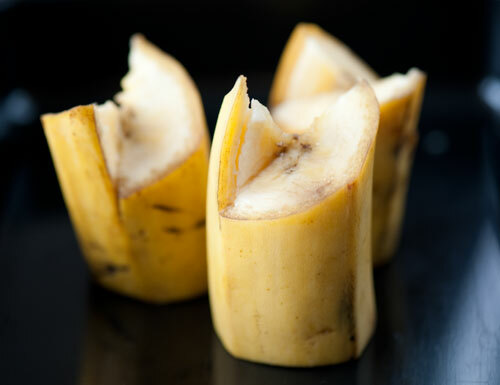 This will prevent the banana from discoloring, though the cut skin will still discolor a bit by lunchtime. (The bit of lemon on the end of the banana tastes really nice too.) There’s no need to treat cucumber with lemon, but you may want to sprinkle a tiny bit of salt on it. And here you have a twisty cut banana. What to do with the bits of banana left over? I just pop them in my mouth, but you could put them in your morning cereal too. More quick and easy bento decoration techniques . 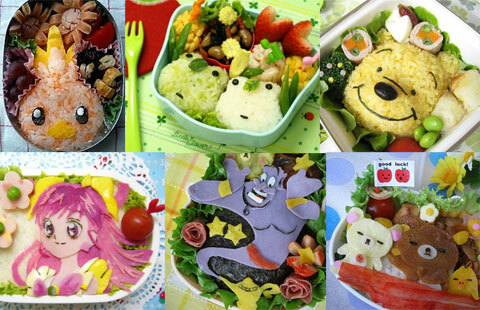 As I’ve stated here many times, I love looking at charaben/kyaraben (cute bento) masterpieces, but I can’t see myself devoting that much time and effort. I’m also a bit nervous about handling food that goes into a bento box too much - and the less experienced one is, the more fiddling around is needed. 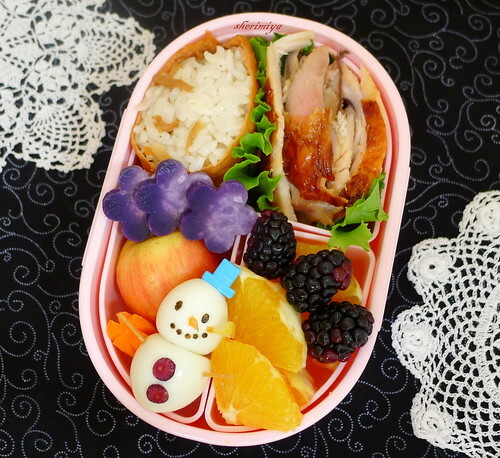 I ran across this method of adding color and cuteness to bentos while perusing Amazon Japan (as I do regularly). It’s so easy and obvious that i was a slap-my-head “why didn’t I think of that!” kind of moment. The book in question is called ラップdeおむすびおべんとう  (rappu de omusubi obento: Obento omusubi (onigiri) with plastic wrap), and it basically introduces the concept of making onigiri wrapped in plastic wrap (Saran wrap), and using stickers to decorate them on the outside. I haven’t actually bought the book yet, but the idea itself is such an obvious and easy way to decorate any bento or lunch box component. 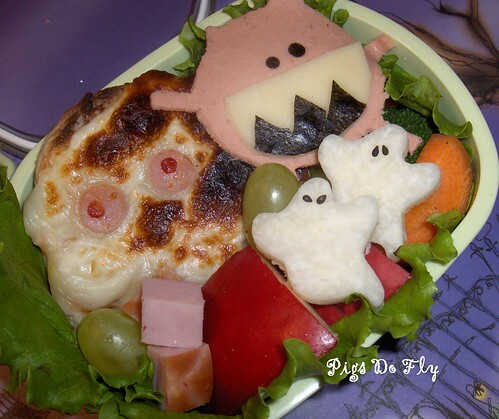 I often read on Japanese charaben/kyaraben blogs that the main reason why they take so much time to create cute bento is to encourage their kids to eat. Well, what can be more fun than opening up your lunch and finding a brownie with googly eyes on it, or a smily-face sandwich? And even a steamed carrot may be more appetizing with a smiley face on it. 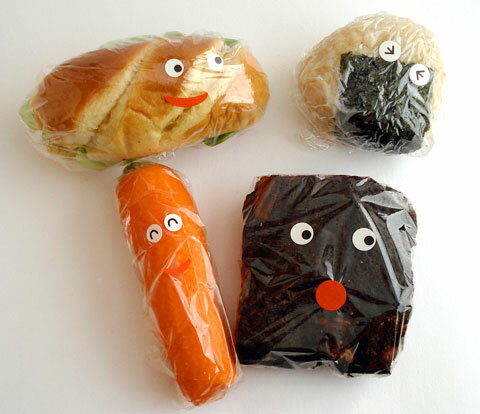 In the photo above, I’ve put sticker faces on a small sandwich, a brown rice onigiri, a carrot and a brownie. It took me about 5 minutes to do all four. Anything that you might wrap in plastic wrap can be decorated with stickers. The easiest way to make your own stickers is to use printer-label sheets, draw or print on your designs, and cut them out (a paper punch is handy for circles). 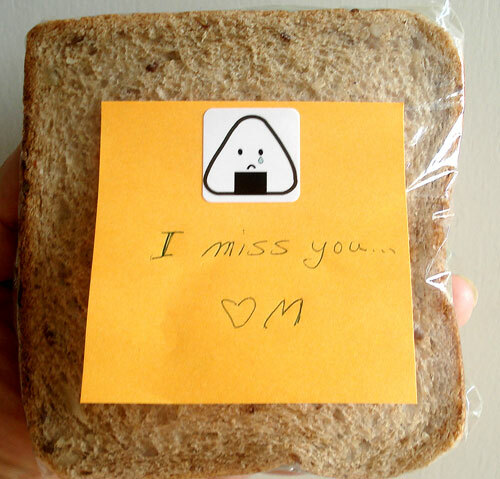 Or maybe your kids can make their own, for you to stick on their lunches. You don’t even have to do faces - if your kids are anything like my niece and nephew, stickers probably breed around them, reproducing themselves like bunnies. Take a few of your kid’s favorites and stick them on! The plastic wrap on the surface you want to decorate should be as smooth as possible. Press them on securely so that they won’t come off and possibly get lost in any surrounding food. 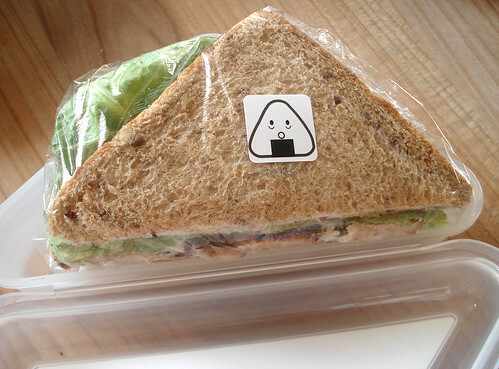 Make sure that the stickers are on the outside of the plastic, and on the top surface, not touching any food directly. Take extra care that your bento is totally cooled down before packing it with stickerized components, otherwise the ink may run and other unpleasant things.